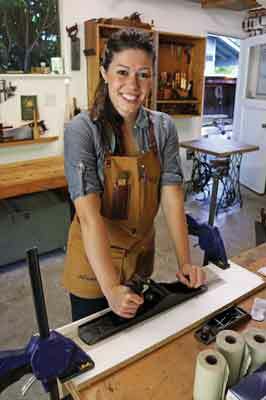 For many woodworkers, craft is a solitary pursuit. For me, it has always been a journey with relationships, rather than finished projects, being the main focus. At Woodworking In America 2014, I became friends with several boutique toolmakers and an idea began to formulate. I have a passion to teach and inspire my peers to preserve disappearing crafts; to buy quality tools once and to build furniture that will withstand the tests of time and style. In my own pursuit of woodworking skill, I have tensioned between a limited budget and the desire to buy and use the best quality tools. My visit to WIA afforded me the opportunity to spend time with the makers of several of my tools and those relationships gave my tools infinitely more meaning. 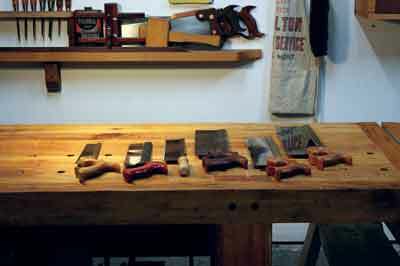 And as it has happened, I've ended up with several Bad Axe saws on my bench, a few as loaners, a few to keep. Mark Harrell, founder of Bad Axe Tool Works, approached me a couple of months ago and asked me why I didn't have any of his saws. When I told him about my Community Tool Chest initiative - a set of quality tools used to create educational blog posts, magazine articles and videos to teach and inspire those interested in learning hand-tool woodwork - he offered a couple of custom saws in exchange for a commissioned piece, which will have its debut at Handworks in May. The rapport Mark and I had via several emails and phone calls was like that of old friends from the outset. Since then, I have been continually impressed by his passion for making quality tools, his customer obsessed mindset and his genuine desire to invest in the next generation of woodworkers. I have been floored by his willingness to drop everything to answer a phone call or a text when I have a question and he has bent over backwards to help move my Community Tool Chest project along. He is kind, disciplined and incredibly knowledgeable. Whether you are making a cross or a rip cut, your workpiece must be secured tightly to prevent chatter, or vibration as you cut. Chatter destroys accuracy and makes it very difficult to saw well. Work can be supported against a bench hook, which uses the forces of gravity to hold stock still, or clenched in a vice. 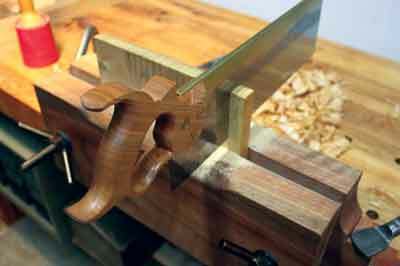 When using my backsaw, my go-to clamping methods are bench hooks and my Moxon vice, which is extra handy because it lifts my work higher off the bench and keeps me from becoming a hunchbacked woodworker. You always want to leave enough room for your saw to work without marking your vice, benchtop or bench hook, but you also want to have as much of your stock as possible supported as you cut. My taste in tools leans more towards the 'classic' look of antique tools, especially old Disston saws with their apple handles and brass hardware. I am very impressed with both the look and feel of the Bad Axe and other boutique tools I've owned and used. Around the end of World War II, the general quality of the big name tools like Stanley and Disston began to deteriorate significantly. Details became increasingly less defined, and eventually we ended up with the plastic handled saws you can buy at any DIY store. For some purposes, these saws are great: I use my Stanley Fat Max saw all the time working around our farm and even in the 'shop, but the blade is hardened - meaning it can't be sharpened, so it is disposable - and the handle is not built for hours and hours of comfortable use. In higher end boutique tools today, much like the quality tools in days of old, the tools actually work as they are intended. The lines are clean, the details are defined, and the finish is beautiful. They can be tuned, sharpened and used for generations to come. Another thing worthy of mention is that new high end tools are generally ready to use straight out of the box, albeit with a little honing perhaps on edge tools. 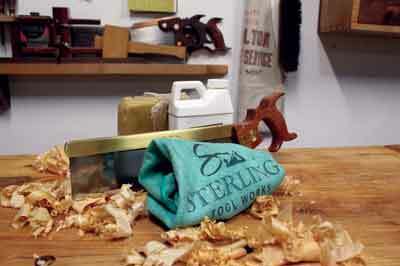 Beginner woodworkers are often frustrated when the new tools they've just purchased don't work like they would expect. Understanding the tune up and sharpening process can help avoid making a bad purchase in the first place. Understanding the range of tasks each tool is designed to do will avoid you purchasing an expensive tool with little purpose in your 'shop. 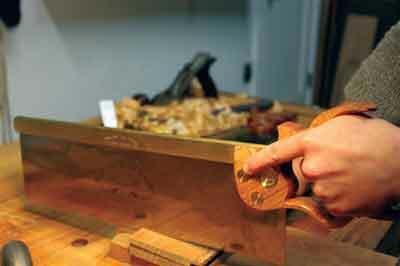 Recently, many boutique sawmakers are making 'hybrid filed' saws. In well filed saws, the hybrid filing is seamless whether doing rip or crosscut. This essentially cuts - sorry about the pun - your saw needs in half. 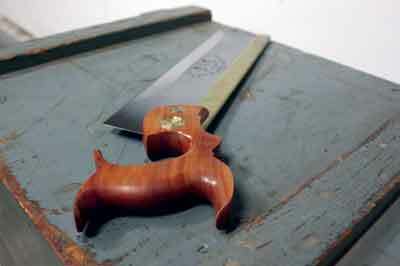 A young woodworker, looking to buy the best tool they could afford once, to keep and use for a lifetime, would have to look no further than a high quality, hybrid filed saw, and could very easily get away with having only two saws in their arsenal: a hybrid filed panel saw filed around 10ppi for large rips and crosscuts and this 14ppi hybrid filed dovetail saw for joinery. The filing is another thing that has really impressed me about Bad Axe saws. Lesser quality saws, regardless of whether they are rip or crosscut filed leave a little ribbon of material behind the saw as it tears through the wood, leaving more to clean up after making a cut. The thing that really set the Bad Axe name apart for me though, was when I received the two custom apple and brass saws with extra small handles Mark built for me. I have very small hands and feet - I can actually shop in the children's department for shoes - so saws and planes with handles built for a larger handed, male dominated workforce have always been difficult for me to wield. My palms get easily bruised and sore during hand tool woodwork because the large handles on my tools rub in the wrong part of my palm. When I opened the saws from Mark, I promptly went into my shop and made about 100 cuts with both saws. The small handles fit my hand so well, not only was it easier to start my cuts, I was able to cut far straighter than I ever had before because there was no slop in my grip. From a beginner's perspective, the terms filing style and PPI likely seem fairly daunting. A backsaw is meant for joinery cuts at the workbench. 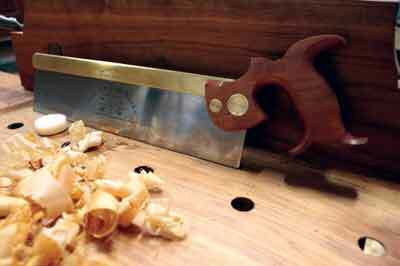 Rip filed backsaws excel at cutting dovetails and sawing down along the grain. Crosscut filed backsaws are made for cutting across the grain and are great for getting stock down to size, for sawing the cheeks off tenons and cutting mitres. PPI is short for Points Per Inch and is a measurement of the quality of finish of the cut: a low PPI will cut quickly but leave a rougher finish, a high PPI will cut slowly but leave a nicer finish. A hybrid filed saw does both, the only sacrifice being that the kerf - or the space left as the saw cuts through the wood - is slightly wider on the rip cuts than it would be if one were to use a classically filed ripsaw for rip cuts. The way you position your body and hold the saw is very important. Use your dominant hand to grasp the handle like you would a pistol, pointing your index finger towards the line you want to cut. 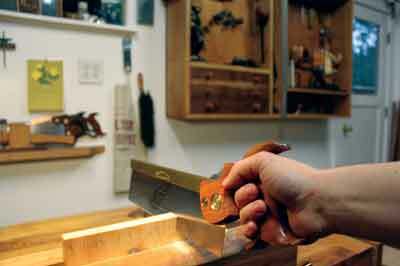 A tendency most young woodworkers have is to grip the saw handle very tightly and to bear down during the cut. A tight grip will cause your saw to wander. Instead, pretend there is a small bird inside your palm and be careful not to crush it. I picked this tip up from Chris Schwarz and it's especially relevant to me since holding baby chicks is one of my favourite pastimes on the farm. The weight of a backsaw itself will use gravity to drift down into the cut without any added pressure or weight on the back of the saw. Align your body with the cut so with your full range of cutting motion, your arm will remain perfectly aligned with the line you are cutting. Keep both eyes open. Place your non-dominant foot forward so as to square off your body. Hold your work with your non-dominant hand to stabilise the workpiece and to close off the system. As you begin your cut, place the tip of your saw on the waste side of your line on the corner away from you. Use the radius of your thumb as a guide for the saw as you gently push the saw into the cut, taking as much weight as possible off the back of the saw. A gentle touch here is key, because if you force your way into the cut, your saw will jump out of your intended line and mar your workpiece. Saw down your lines using the whole plate of the saw at a slow and steady pace. As your skill improves, so will your speed. After you have the basic body positions down, it is time to practise. 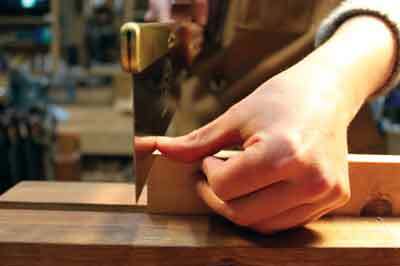 Draw a succession of lines for both cross and rip cuts on several pieces of scrap timber. Practise sawing to your lines for a few minutes each day and you'll be a professional sawyer in no time. Anne Briggs Bohnett is the inspiration behind the Community Tool Chest and the increasingly popular Anne of All Trades blog featured in F&C 225. We were fortunate to meet with Anne when she launched her project to assemble not only the perfect set of hand tools but also those that came with a story attached. 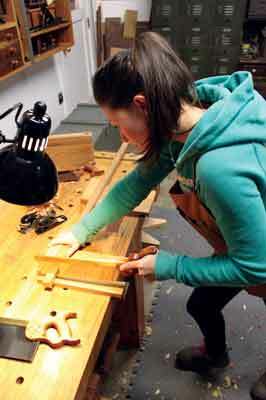 In the months ahead Anne will be sharing tips and techniques from professional tool makers and woodworkers as she seeks to develop her repertoire of skills in the workshop. Just as buying cheap does not necessarily mean substandard, paying more now and then might just work out cheaper in the long run. So whether it is refurbishing a flea market bargain or investing in a custom made heirloom tool, Anne is going to show you how to choose wisely and buy once.